Babies have very sensitive systems and skin that can be very susceptible to certain factors. A good example of this is wintertime when people are using their central heaters. During the cold winter months, the humidity inside drops to 10% or less. Dry air car irritate an adults nose, lungs and skin, so imagine what it can do to a baby. There are a large number of baby humidifiers available for parents to choose from. With numerous styles, colors, shapes and sizes to choose from, it could be quite a challenge to choose one. Learn about the top rated baby humidifiers below and see which features and styles work for your needs. Another problem with cold and dry air is that it becomes a good breeding ground for viruses. Add in the problem that young babies can’t take the same medications that adults can when they don’t feel good and you have a very good reason to keep a humidifier in the baby’s room. 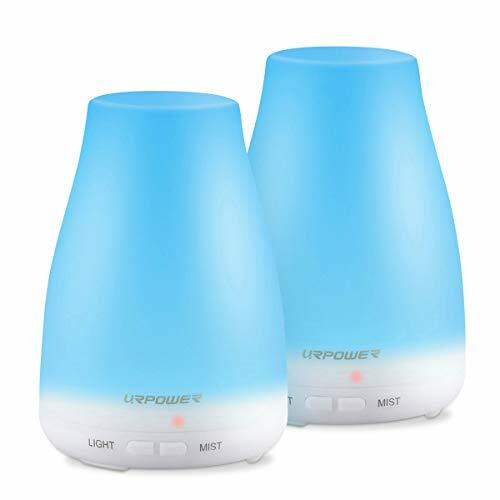 If you’re looking for a functional and useful baby humidifier but don’t want to sacrifice style, the URPOWER Aromatherapy Humidifier will fit the bill perfectly. The portable, small size of the humidifier means you can easily move it from room to room with no problem. Your home will stay comfortable, hydrated and will smell good too. The top of humidifier twists off for easy filling and cleaning. If there is no water in the humidifier, it will automatically power off to protect the motor. The power cord plugs into the bottom with a side space so the diffuser/humidifier sits flat. You will get 3 hours of continuous use from this humidifier before it has to be refilled. It comes with a 45 day money back guarantee and 18 month warranty. One of the big draws to the Honeywell Germ-Free Humidifier is that it has UV technology that helps to get rid of up to 99.9% of all bacteria, mold and fungus that is in the water. One of the problems that can occur with humidifiers is that bacteria can grow in the water tanks. Honeywell makes sure that doesn’t happen so the water and the mist that it expels, stays safe for your baby. It has a large 2 gallon capacity tank that is easy to fill. Cleaning and carrying is easy too so even if you have to move it, you won’t have a difficult time. Some of the parts of the humidifier can be washed in the dishwasher for added cleaning. It is the perfect size for medium sized bedrooms and has a self regulating evaporative system that adjusts the output to the amount of moisture the air can handle. The quiet operation won’t disturb the baby during naps or bedtime and it comes with a 3 year limited warranty. The humidifier can run for a full 24 hours on a full water tank. It eliminates many different kinds of molds, fungus, and bacteria a full 99.9% after just 2 hours of continuous use. 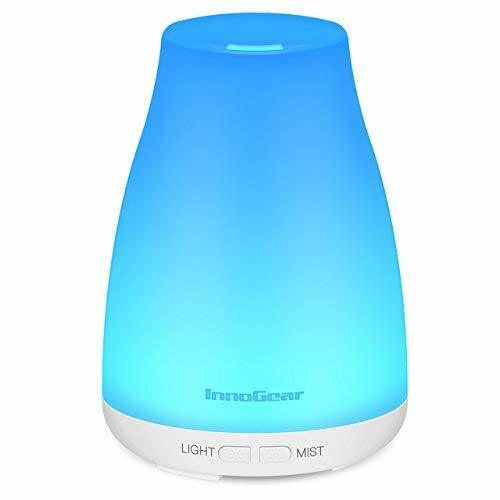 Get 100% satisfaction with the Innogear Ultrasonic Cool Mist Aroma Humidifier. It is the perfect size for small to medium size bedrooms and is great for helping to prevent colds, flu and congestion, especially during the winter months. Turning on the button transforms the humidifier into a light show that goes through 7 colors or can be set to remain on one color of your choice. There are three settings that can be alternated through. Press green and get intermittent mist that will mist for 30 seconds and then pause for 30 seconds and so on. Press red and get continuous mist or turn it off and use it as just a light with changing color. The cool mist humidifier has an auto shut off that will activate when the water runs out so the motor of the humidifier doesn’t burn out. The tank has a water capacity of about 100ml and the noise is low, less than 35 dB so it won’t keep your baby awake. Parents will have 3 hours of continuous use or 6 hours of intermittent use at a time. It is the perfect humidifier that also provides soothing and comforting lights for your child. Choosing the right baby humidifier doesn’t have to be as scary as it seems. Even though there is a large selection to choose from, once you have the right information and also are clear on what your personal needs are, you can choose one that will match those needs. You will feel a lot better having a good quality baby humidifier in the room because of the benefits they provide. It is used often when babies get sick, but it can also be used to keep the room hydrated and comfortable and prevent your baby from getting sick in the first place. The top rated baby humidifiers featured here are small and portable and have lights that work as a great night light for your children that are sensitive to the dark. Learn more about choosing the right humidifier in our buyer’s guide below. There are many benefits that a humidifier provides a baby which is one of the reasons they are so popular. Moisturizing the air helps babies get relief from congestion and the symptoms that can accompany colds and flu. It can also help with relieving skin problems that can arise due to the dry air that goes along with the cooler winter months and using central heating systems. Chapped lips, dry eyes, itchy skin and general dryness are common problems during the winter. Using a humidifier in the baby’s room can eliminate these problems and provide other benefits as well such as better sleep. Many of the current baby humidifiers are not loud when they run, but the soft hum of them can also be a soothing sound that lulls the baby to sleep. When it comes to choosing a humidifier for your baby’s room, the sheer number of choices available can make that task seem overwhelming. There are two basic types of humidifiers on the market and knowing the differences and features of these different types can go a long way toward making the choice much easier. Cool Mist – There is no heating element present in a cool mist humidifier so the vapor that is released into the air is room temperature or a little cooler. One of the big benefits of cool mist humidifiers is that there is no risk of the baby getting scalded if they get too close to the warm mist. Cool mist humidifiers are a much better choice for any baby suffering from croup. Warm Mist – Sometimes warm mist humidifiers are recommended by a baby’s doctor. The general consensus is that warm mist humidifiers kill germs and viruses during the process of creating the warm mist. They also feel that warm mist makes it easier for the baby to breathe, especially if they are suffering from a cold or the flu. Warm mist humidifiers are more expansive than cool mist because of the heating element. Even though there are only two basic types of humidifiers, there are many different styles, sizes and designs that can be present in each type. Below we will discuss the different styles that humidifiers can come in. Tabletop humidifier – This small, portable humidifier is for use in one room, typically a small to medium sized one. This is the most popular size that is purchased to use in the baby’s nursery since it can fit right on top of the dresser or a shelf. 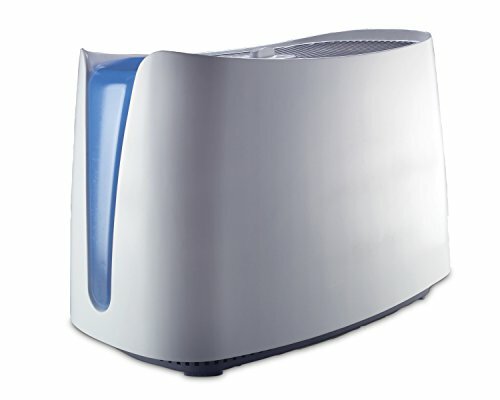 Console humidifier – Console humidifiers are much larger in size and have enough power to humidify the whole home. Most console humidifiers can hold five to nine gallons of water at a time. Many units have wheels which makes the unit much easier to move from one room to another. Console humidifiers cost more than table top because of the increase in size. In-Duct Humidifier – This type of humidifier is actually professionally installed with the duct work of your home. There are many benefits to having an in-duct humidifier. They require less maintenance and are more energy efficient than tabletop or console humidifiers. They also provide the healing and comfort benefits for everyone in the home and not just the members of the room the humidifier is in. There are a few disadvantages to an in-duct system, the top one being the cost to install it. They can cost several hundred plus the cost of installation which many people may be hesitant about spending. Vaporizer – This is not really a humidifier but sometimes parents use a vaporizer to moisturize the air for their baby’s comfort and health. Many parents prefer vaporizers because the water is boiled before the steam is emitted which means that there is less chance of spreading germs in the air. There are several different features that a humidifier can have that make one more desirable to use than others. We have listed those common features below. Before you start shopping it is helpful for you to know what features are important for you to have with the humidifier that you purchase. Humidistat – This built in humidity meter helps the parent know just how much humidity in the air. You want to keep the humidity levels between 30% and 50% and the humidistat can help you maintain those levels. Auto shut off – The automatic shut off feature does several things. It saves energy, and it also helps to prevent the wear and tear on the humidifier by running without water in it and burning up the motor. Anti-Microbial – Some models of humidifiers offer technology that kills germs and prevents mold, bacteria, mildew and viruses from growing in the water reservoir. Humidifiers that have this technology do not require the same amount of cleaning that units without it do. Replaceable filters – Some humidifiers have wicks or filters. Depending on the unit, the wick/filter will be permanent or will require regular replacement. The humidifiers that have filters tend to cost more and they also cost more in terms of maintenance and filter costs as well. Aroma Therapy – Some units offer the ability to add essential oils to the unit so it not only adds moisture to the air, it adds scent as well. This is a very pleasing effect as you can add lavender essential oil if you want to have a soothing, calming scent in your baby’s room. Lights – Many humidifiers, including the top rated baby humidifiers we have reviewed here, have lights that can be used during the operation process. Many have several different colors available that the humidifier can cycle through. Many styles have the option of being able to cycle through 5-7 different colors or parents can choose one color. Different colored units – There are many different designs available when it comes to humidifiers. From tear drop shaped to those that look like mushrooms, there is a style or design that will work for any nursery décor. They are available in a variety of colors as well. There are certain precautions that parents need to take when using a humidifier. They are very safe as long as they are used properly. Make sure that you use the proper precautions when using a humidifier in your baby’s room. You always want the humidifier to help the baby and never pose any threat or danger. Use distilled water – Tap water contains minerals in it which can cause a lot of build up within the humidifier. Once it has built up, it can actually be blown into the room. For this reason, it is better to use distilled water which does not have those minerals in it. Keep humidifier unplugged when not in use – If the humidifier is plugged in when the baby is up and about; there is a danger of them pulling it down onto themselves if the cord is hanging. When you are not using the humidifier, be sure to unplug it or if you need to use it during the waking hours, make sure the baby or toddler cannot reach the cord or the humidifier at all. Avoiding Germs – Humidifiers can spray germs into the air if mold, mildew, bacteria and viruses are allowed to grow in the water reservoir. You can minimize this from happening by purchasing an anti microbial humidifier and also by making sure that the humidifier is cleaned regularly and allowed to dry thoroughly before outing back in the room. Too much dampness can increase dust mites and mild so be very sure that you are not putting too much moisture in the air. Proper Cleaning – Making sure that the humidifier is cleaned properly is very important in ensuring the utmost safety for your baby. Mold and bacteria can grow very easily if you’re not careful. Mold can grow very fast; only 48 hours on a damp surface, so paying attention and maintaining your humidifier daily is a habit you should get into from day one. Follow the manufacturer’s instructions on the specific ways to clean your humidifier and also regularly clean it with a bleach solution. Using a humidifier in your baby’s room and making sure that humidifier is properly maintained provides many different health benefits that are just too good to ignore. When you first bring your baby home they are too young to be able to take any kind if over the counter medication which makes the symptoms of colds and the flu even harder on their little bodies. A good humidifier will make it easier for babies to breathe when they have colds and the use of the humidifier will also help prevent them from suffering unduly from bad symptoms. The top rated baby humidifiers on the market have many features that make them very useful baby items to get. They make perfect gifts for new parents as well.